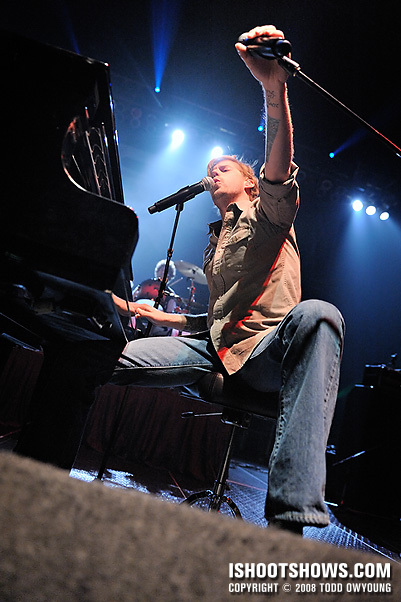 September 26, 2008 – Forget whatever you think you know about piano rock. 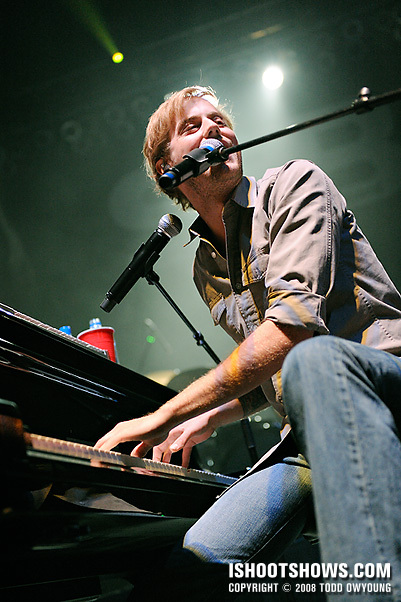 When Andrew McMahon hits his grand, the floor is going to bounce. 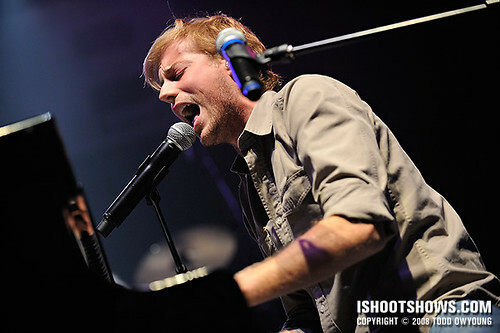 Slamming the ivories with rock star finesse, McMahon and Jack's Mannequin stormed the Chaifetz Arena to deliver an explosive performance that shook the house to the rafters. 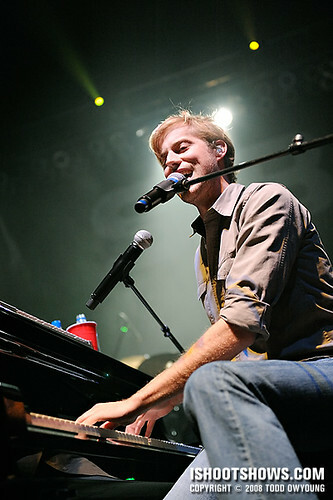 Whether seated at his piano, standing over it, or running around it, Andrew McMahon was the undeniable center of attention on stage as he drove home fan-favorites throughout the night. 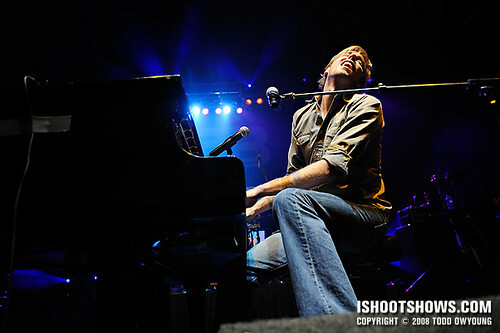 As circumstance would have it, this was the third time I'd had the pleasure of photographing Jack's Mannequin in as many months. 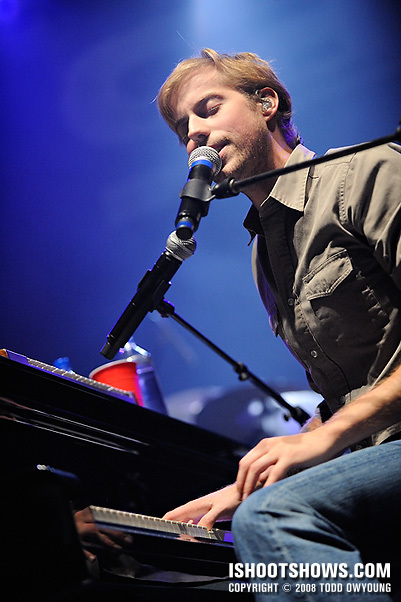 The first gig was at Warped Tour in July, followed by the band's Pageant show in August. 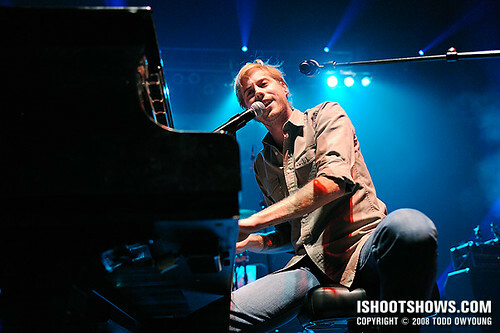 Andrew McMahon proved to be ever the dynamic subject, and was a treat to photograph again. 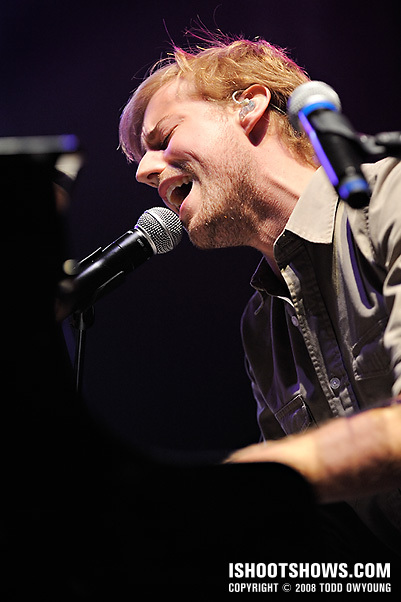 As with the previous two shoots, one major factor was the two microphones that Andrew uses, so finding clear sight lines was a constant concern as the singer switched between them. I found the best angles to be in front of Andrew's monitor and shooting from stage left, down the arm of his front mic stand. For their performance at the Chaifetz Arena, the big variable coming into the show was lighting. I was crossing my fingers for spotlights, but it just wasn't in the cards. What we got for the first three songs was a mix of very quickly changing color washes, with bursts of tinted frontlighting. This is one set where I would have loved to set up just a few flashes for a blend of more neutral lighting. Maybe next month! You can stream the full album from Altpress.com, and also find out more at theglasspassenger.com. 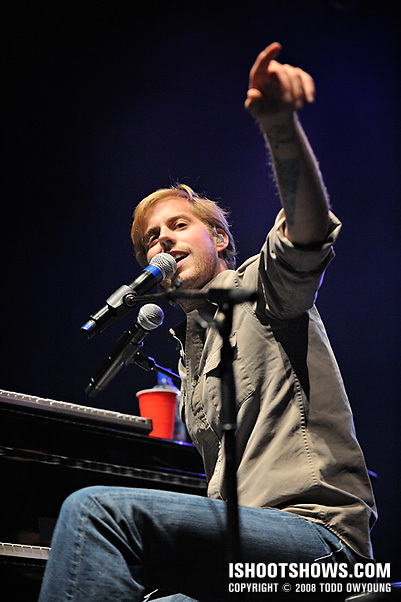 Also, you can check out Buzznet‘s interview with Andrew McMahon about the new album here. Already listened to The Glass Passenger? What do you think? Man… this set was so much fun. I mean, it was interesting due to the very low stage and 5 of us being in the pit… but he is my favorite artist, and I enjoyed every second of it — yes, even getting kicked out. So many great photos… I love the noise control, as usual; great smooth colours. Picks: 1, 2, 5, and 10. 10 is an especially interesting angle, and even with the monitor I think gains my pick [that or 5]. It gives a sense of closeness not felt in the other photos. GOD I love this man. As for his new album — I agree with Keith, it certainly has a new feel. I don’t think Keith is as fond as it as I am, but I think it brings something I’ve been waiting for, even if I may not end up loving all the songs. My pick for songs thus far is the token single, The Resolution [gave me goose bumps the first time I heard it], Spinning, Swim, Bloodshot, Crashing, and American Love. Seriously… I love that man. Yes, I would have his babies. The pit situation was certainly interesting, as there was basically only one very focused point of interest on stage. 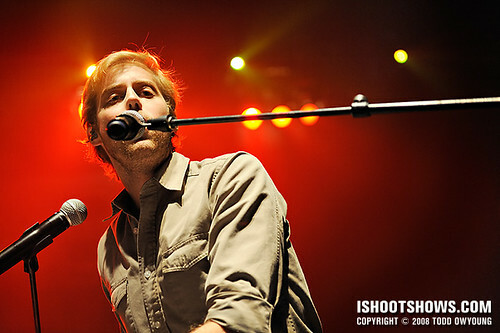 No dig against the other members of the band, but it really is the Andrew McMahon show. 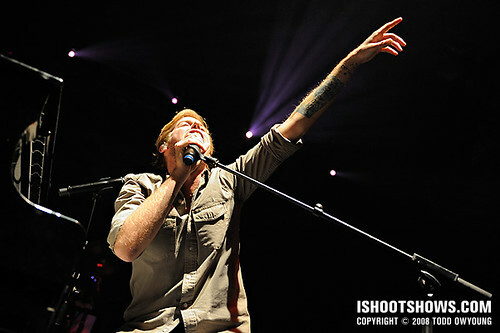 I really like the one with him pointing and the light behind him was perfect. The close ups are amazing, and you got him looking at you again haha. 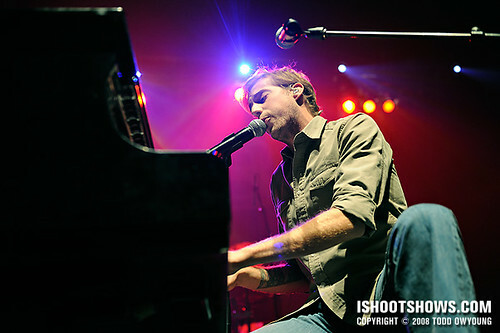 I love watching Andrew, his passion and talent always render me speechless.. and so do your pictures. Still kinda bummed i’m missing him when he comes though. PS, wasn’t the Pageant show in August? Hey Jessie, thanks for the comment. I have no idea where JM is playing next month, just kidding. But really, give me spotlights and I’m there. 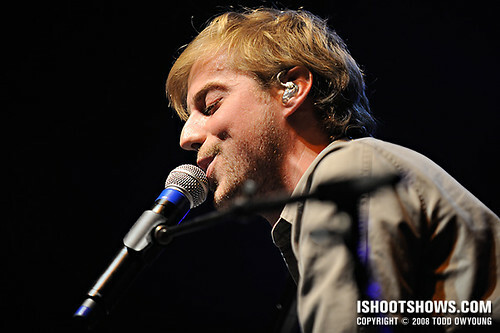 Andrew really is a lot of fun to photograph, he really steals all the light on the stage. You’re right, the Pageant show was in August. Chris you crack me up… have his babies hahaa. yeah so i am kinda interested in what did you do to get kicked out? and the album, right now i like Everything In Transit better, but it might grow on me. The new album is less angry, in terms of lyrics and performance, i think. And The Resolution is definitely one of the best. New stuff like Annie Use Your Telescope and Bloodshot is growing on me. 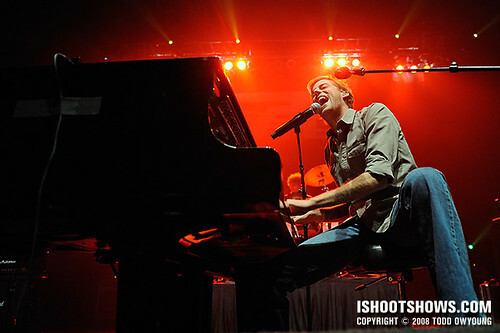 And the piano solo on Caves… oh my! I think “The Resolution” is probably the biggest, full-throttle track that is the easiest to get into coming from Everything In Transit. I’ll have to see what stands on subsequent listens, though. love love LOVE and adoration! And here I was expecting bad lighting! These are fantastic! I love the vibrant reds and blues! As for the CD… I didn’t like much off of it at first, other than The Resolution, but after listening to it for the past few days, it’s definitely growing on me. Ha, the lighting could have been worse. I’ll just say that I had to give the WB in these shots a little help, and leave it at that. Where is JM playing November 9? 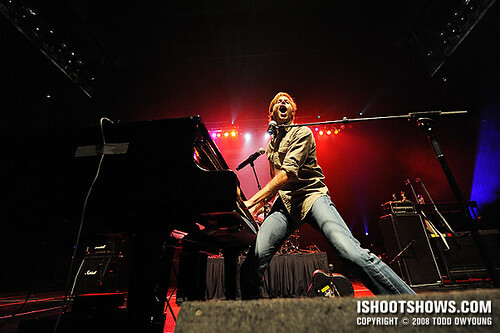 I will be in Florida that weekend, so I think that will end my prolific shooting of the band here. Until next season, anyway – we’ll see. Thanks for the comment, Tasha. Jack’s is playing in Chicago with Treaty on the 9th, it’s acoustic and it’ll be sweet. Acoustic, nice. I wonder if Andrew will be easier to photograph. With Andrew switching between the two mics there was a little patience that’s required for some shots. He uses the mic at the piano most of the time, so it was mostly waiting for him to use the one parallel to the edge of the edge of the stage. A little WB tweaking never hurt anyone. They’re playing at the Bottom Lounge. Very tiny, one step up from a bar. Florida sounds much more exciting. WB tweaking, and not pressing the button while Andrew was bathed entirely in red or purple light. It’s the little things! I’ve been browsing through your site for the last couple of weeks, and I have to say you’re phenomenal. 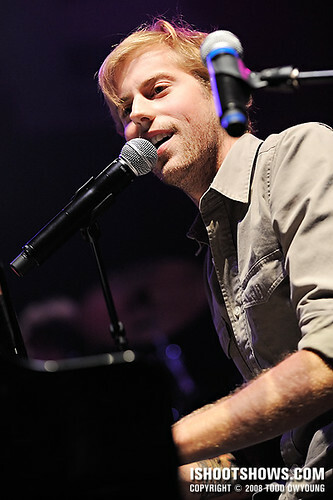 And I love Jack’s Mannequin (though I think he looked better with his short dark hair. Though, seeing as he’s fortunate to have hair again he can do what he pleases with it!). Thanks very much for the kind words, Ash. Glad to hear you enjoy the work! 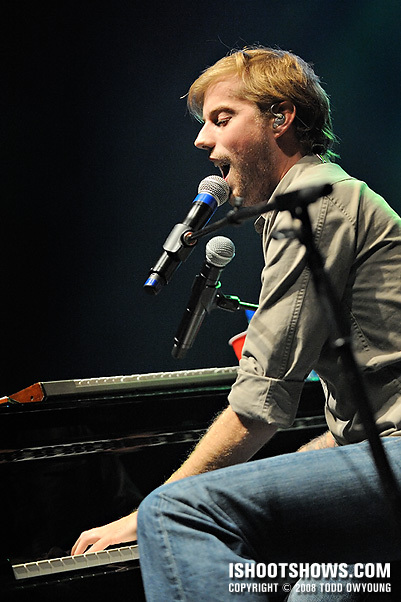 Jessie — whenever I’ve seen him play La La Lie, he’s always like… “This song is about friends and drinking…” and all the good times. Haha, I love that man. And I’d have his babies. Who can argue with a song about friends and drinking? Not this guy. Great pictures! Did you happen to take any of the opening band Treaty of Paris?? Hey Heather, I did photograph Treaty of Paris, but I’m afraid to say that the lighting was pretty dim for their set. I’ll have to check out the images to see if I can put together a set. The pictures are beautiful, just like Andrew haha. You should just forget about Florida and see Jack’s Mann again. Hey Molly, thanks for the comment, glad to hear you like the images. I’m buying my plane tickets soon, we’ll see.